My boys have recently discovered Mad Libs. Our road trips are so much more fun and funny! Little boys can’t help but fill all the lines in with potty talk! They seriously cannot get enough. 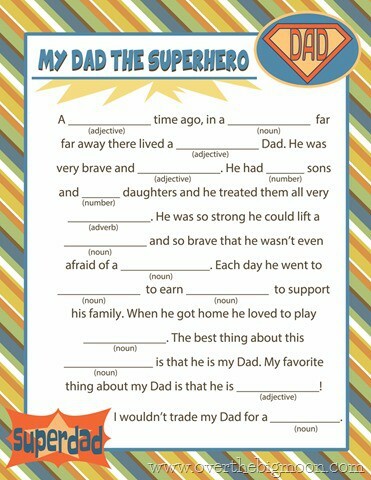 I decided for Johns Fathers Day card this year I would create a Mad Lib for the boys to each fill out separately for him. I think it will be so fun to have John open them all and see how each story ends up differently depending on the boy it is from. I wanted to share it with you too! 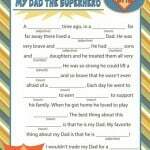 Looking for more Fathers Day ideas…check out our Fathers Day free printable we posted on WhipperBerry! The cute clip art I used is from the Bubblespark store on etsy. They have great clip art and right now it is on sale. Use the code SUMMER2014 for 30% off. My kids are way into Mad Libs right now. Nine year olds are so silly! I bet they’ll love this! Pinned! It’s not downloading for me..? It downloaded for me….if you cant get it to work email me lisa@overthebigmoon.com and I will email it you. Hahaha, this is fantastic. I think we’re going to use this one. My girls LOVE doing mad libs!